This item is made from natural materials. Please note that there may be slight variations between the image shown and the product itself. Ships within 7 business days. Please allow up to 3 additional weeks transit time for your item to arrive. January 04, 2016 by Susan D.
I used this side board under a TV in a family room. The color and quality are represented well on the pictures and works perfectly for my needs. Looks like an antique but works like new. November 09, 2013 by Jackie D.
Just received this piece, and it is gorgeous. Pictures do not do it justice. We are using it as a wine bar/absinthe bar in our living room. This decor in this room is French Country, and the sideboard is absolutely perfect!! I highly recommend this item of furniture. You will not be disappointed! French Country style rooms have such an effortless sense of style to them. One of the reasons is the seriously functional storage pieces that anchor the room. 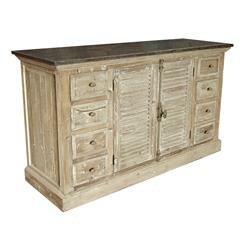 This large, whitewashed sideboard is a perfect example, offering ample space and vintage inspired good looks.